Relax in traditional beauty with this handsome glider recliner in your home. Use the easy power recline mechanism to put your feet up and unwind after a long day at work as you watch TV or read a book in plush style. Pillow top arms and the memory foam seat make it easy to be comfortable all night long. Top stitching completes this recliners traditional elegant look for a style you are sure to love. 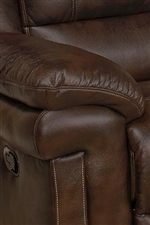 The Hastings Traditional Power Glider Recliner with Pillow Top Arms by New Classic at Carolina Direct in the Greenville, Spartanburg, Anderson, Upstate, Simpsonville, Clemson, SC area. Product availability may vary. Contact us for the most current availability on this product. Traditional opulence is yours each and every day when you add this handsome Hastings collection to your living room. 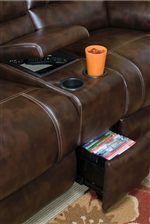 You have your choice of either power reclining pieces or non power reclining pieces to find the one that suits your lifestyle perfectly. Elegant top stitching gives this collection a lovely look that you are sure to love in your home. Plush memory foam seats completes this collection to create a comfortable experience that you will love relaxing in every night. The Hastings collection is a great option if you are looking for Traditional furniture in the Greenville, Spartanburg, Anderson, Upstate, Simpsonville, Clemson, SC area. Browse other items in the Hastings collection from Carolina Direct in the Greenville, Spartanburg, Anderson, Upstate, Simpsonville, Clemson, SC area.